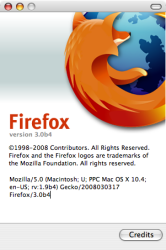 Mozilla Firefox 3 Beta 4 was released today. The release notes claim that more than 900 enhancements over the previous version have been included in this release. So far, I haven't noticed a real difference in my normal use. I guess that's a good thing, really. To me, that means we're working with a near production ready product. Unfortunately, this version of Firefox 3 still does not fix the problem with Gmail (also known as bug 415252). That's not a deal-breaker in a beta release, but the problem must be resolved before the product can ship. Let's not forget Gmail itself is beta! That being said, Google's betas are often better that some people's production software! I agree there. I would love if greasemonkey would work in FX3b4. That is key for me, well that and no memory leaks/hogs. I would like to see some of the better Greasemonkey scripts incorporated into Gmail. Isn't that how colored labels came around? What's your favorite Greasemonkey script? I don't have any "fun" scripts really, just stuff that I use on the intranet to get work done. I have seen lots of good stuff for Gmail out there. It would be cool to see some sites take heed to what people want to see changed.